This iced coconut caramel mocha will definitely wake you up, and cool you down. 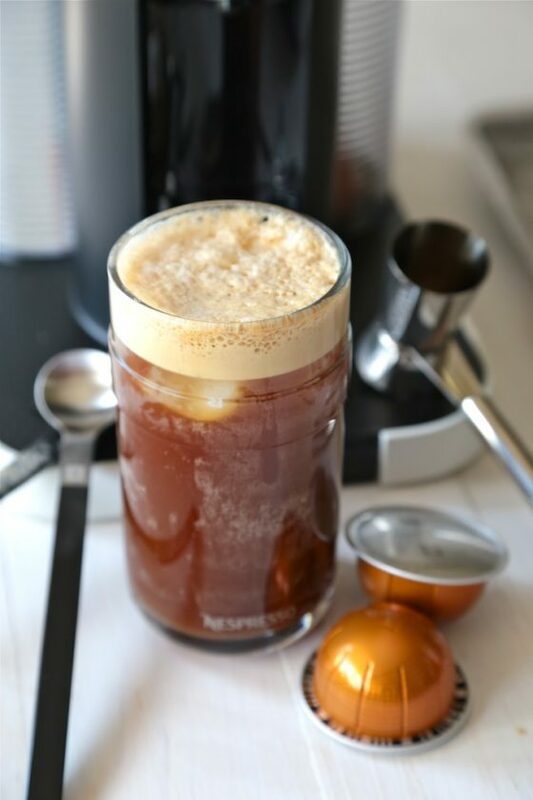 Make a perfect frothy pour for one or more with Nespresso’s Vertuoline. Ben always brews too much coffee in the mornings, and half the time I end up running out the door with only a half cup of coffee to my name and we have half a pot let behind. 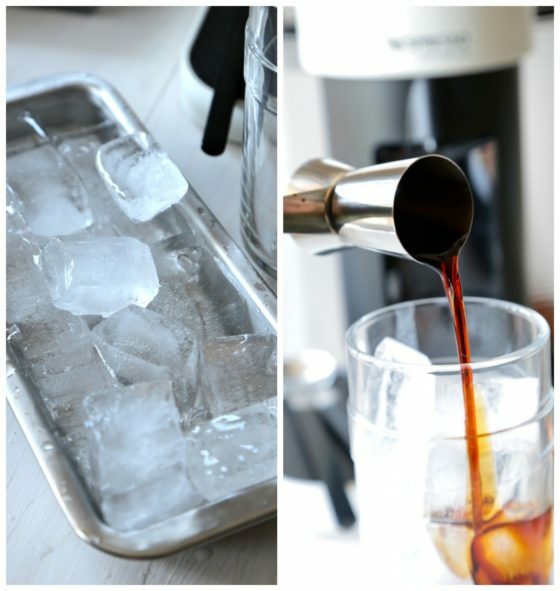 Instead of dumping it all out – we would just put the decanter into the fridge for me to make an iced coffee the next morning before he brews the next pot. As a born and raised Seattlite, I know this is an egregious coffee sin. It started becoming faster for me to drink yesterday’s cold coffee in the morning than anything hot – not that it was necessarily “good”. But it’s changed, and I can drink good coffee again, hot or cold. When I wake up at 4 in the morning and am off to the races from the time I get up to the time I race out the door, waiting around for coffee isn’t always an option. But options are endless with this Nespresso and I’m a girl who loves variety, and speed. Ben may still make fun of me for my cold coffee addiction – even at 4 am – but at least I know this is top drawer cold coffee, and not my day old questionable stale stuff of yore. I am reformed. Hallelujah. 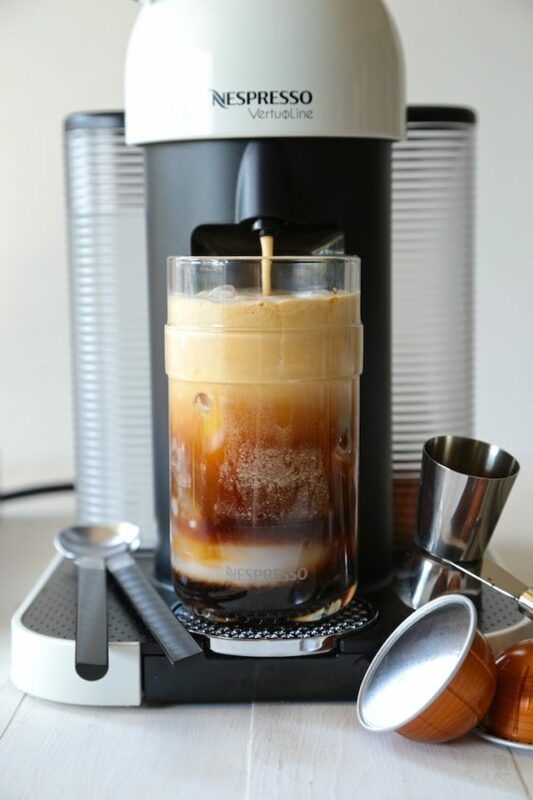 Nespresso recently released the new line of large-cup coffees including the Caramelizio variety to celebrate it’s 1-year anniversary of the VertuoLine system! For me being the iced coffee lover in the house, brewing a pod of Caramelizio over a cup full of ice with a little coconut and chocolate syrup was just the ticket for this Iced Coconut Caramel Mocha. And if you want to make it hot, just skip the ice and brew it hot. The VertuoLine makes mornings, and entertaining, easy when you can brew one cup for a quick fix, or have a variety of cups ready for guests to brew themselves when you have guests over. The possibilities are endless and your stress remains low. Fill a glass full of ice cubes. Pour 1 ounce of coconut syrup over ice cubes, followed by one ounce of chocolate syrup. 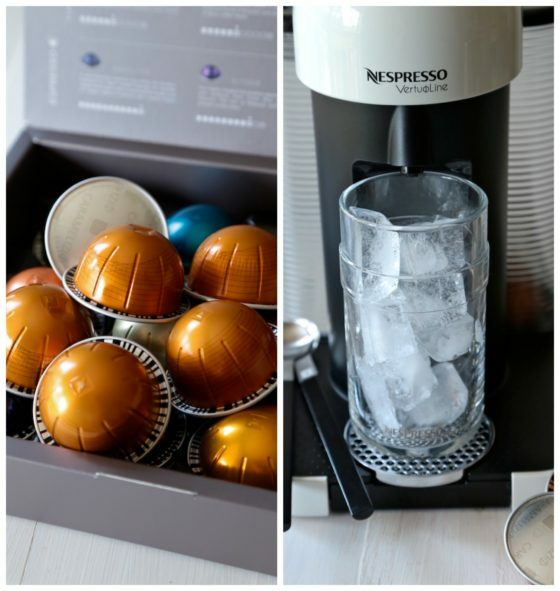 Place Nespresso Caramelizio Capsule into Nespresso Vertuoline machine, and brew coffee directly over the ice. When finished brewing, using a long stemmed spoon, stir coffee, and syrups together. *If necessary, substitute strong brewed caramel flavored coffee to recipe. 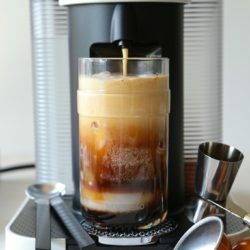 *Fine Print* This recipe and post was sponsored by Nespresso to feature the new Caramelizio capsule and the Vertuoline. All opinions are my own.